Almonds. I don’t know if that’s the yummiest thing I could choose but I love them, eat them daily, and they’re expensive as all get out! Ferris Bueller’s Day Off because smart high school hijinks are always good for a laugh. Clueless – I can’t even explain this one. Cher just makes me laugh. The Proposal because the “Why are you naked? ?” scene makes me belly laugh every. single. time. Practical Magic because – hell, because I obviously have an enormous girl crush on Sandra Bullock and love watching her movies! Let’s see…I’d probably have my laptop, tweaking the latest blog post or scheduling tweets for the next day. BrightSide would be hanging out nearby, loving on a dog while catching up on the news or kicking it with Bear. You can usually hear T-man hollering in his game room, deep in the throes of Fortnite insanity, while the dogs loll about waiting for snuggles (or, in Gracie’s case, food). 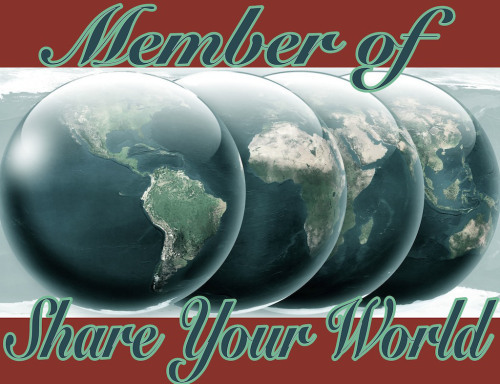 Cee’s Share Your World is part of Monday’s fun. What’s happening in your world today? I have no idea how many times I’ve watched that movie and I love it every single time!! 😀 I forgot Ferris Bueller’s Day off… I loved that movie! Yep. These are all movies that stop me in my tracks if I stumble across them. Doesn’t matter what part of the film it is, I’ll sit and watch to the end.